I’m really starting to get into this whole fruit on pizza thing. I recently posted a Peach and Prosciutto Pizza and I loved it so much it kept me craving more. 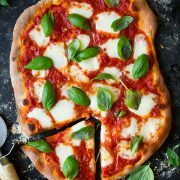 Pizza is one of my favorite foods and I was starting to get bored with the same tomato, basil, mozza pizza all the time, so I’ve stepped outside my comfort zone and let me tell you, it’s amazing! It’s kind of like pizza crust is just a blank canvas and you just need to decide what you are going to paint on it. But honestly, we are all obsessed with pizza so why do we keep buying and making the same kinds over and over again? Let’s add in a little pizzazz to these pizzas! This recipe is just like one I ordered at a restaurant, twice last week. My husband and I loved it so much we went back. But both times they forgot to put one of the main ingredients on my pizza, so forget that, I’m making this thing at home. 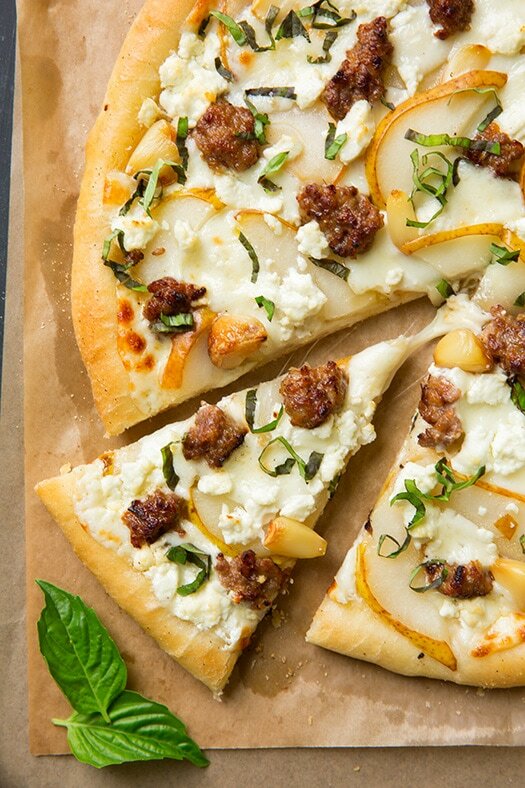 If you like flavor, you’ll love this pizza! You can even add a few herbs to the olive oil, for brushing over the pizza dough, for one more layer of flavor. Enjoy! 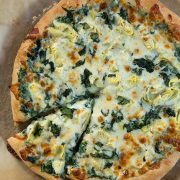 Not your ordinary pizza - this version is brimming with flavor and delicious contrast! Preheat oven to 400 degrees. Remove loose papery outer layers from garlic (the cloves still remain intact), and cut about 1/4-inch from top to expose garlic cloves. Set garlic over a piece of aluminum foil (large enough to well wrap around garlic), drizzle 1 1/2 tsp olive oil evenly over top of garlic, then wrap with foil to enclose. Bake in preheated oven until nearly roasted through (not quite fully because it will continue to roast on pizza), about 28 - 30 minutes. Remove from oven and set aside to cool, then remove cloves from skins. 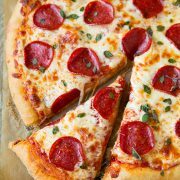 Increase oven temperature to 450 degrees and place an pizza stone in center of oven. On a large sheet of parchment paper lightly dusted with corn meal (or flour), shape and stretch pizza dough to 12 1/2 inches. Brush top of dough evenly with 1 1/2 Tbsp olive oil then sprinkle top evenly with pepper and salt. 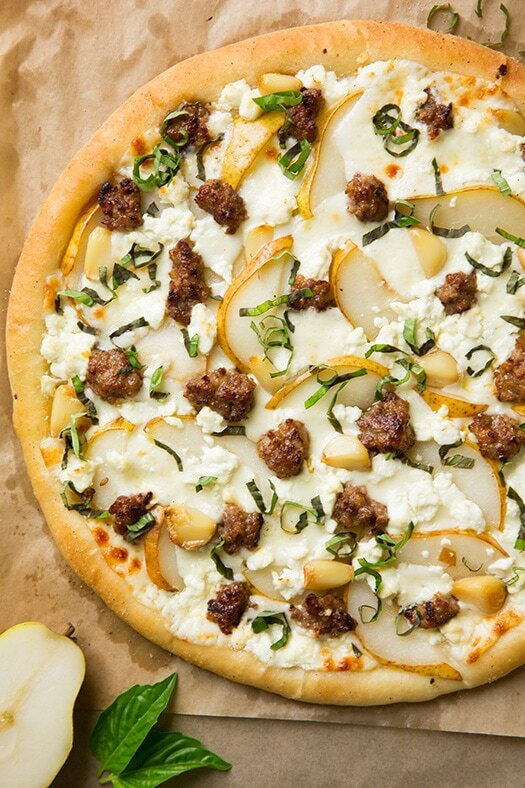 Layer pears, mozzarella, goat cheese, cooked italian sausage and garlic cloves over pizza. Using a pizza peel, transfer pizza on parchment to hot pizza stone in oven and bake 11 - 14 minutes until crust is golden and cheese is melted. Remove from oven and sprinkle with basil ribbons. Slice and serve warm. *I recommend using the kind that comes shaped like a cylinder (not fresh for this recipe though). Part skim or whole. **I slightly undercooked the sausage as it will continue to cook in the oven. Just make sure it's fully cooked through after baking.